It’s the 15th day of the month and it’s bills paying time again for the Sombrero household. Bills paying time sometimes depresses me. A lot of money comes in but I never get to buy anything nice for myself (anything nice meaning expensive things that makes Alvin’s eyebrows shoot up to his forehead by the mere mention of them). It’s always distributed to the house rent, expenses and house help salaries. Anika’s milk and diapers are like buying two pairs of Havaianas weekly! Seriously. Presenting… MY PAUL SMITH BAGS WISHLIST!!! The Paul Smith Harriet handbag is a flat shoulder bag made from classic swirl printed calf leather with a centre front deployment buckle feature embossed with the Paul Smith signature logo. The bag is zip opening, features golden brushed hardware and is fully lined in beige swirl patterned jacquard fabric with an internal zip pocket fitted. A further two pockets are also feature inside – one perfect for mobile phone storage. The Paul Smith, Charlotte bag is a soft structured clutch with an adjustable strap handle made from classic swirl printed calf leather. 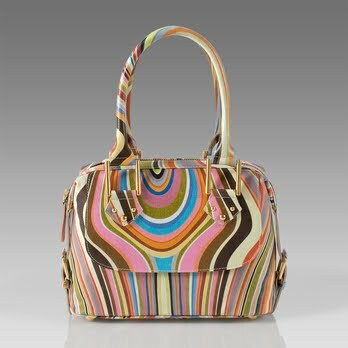 Paul Smith Tara handbag bag made from swirl soft grained leather and golden Paul Smith signature embossed metal hardware. This bag is styled with a top zip fastening, magnetic front flap pocket, and two adjustable side tabs. 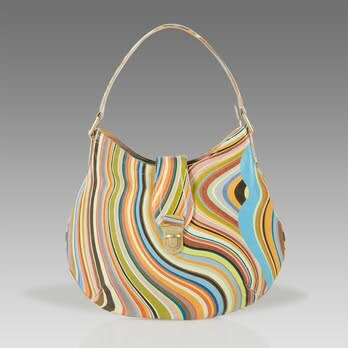 Internally the bag is lined in cream fabric lining and a side zip pocket with a swirl trim. 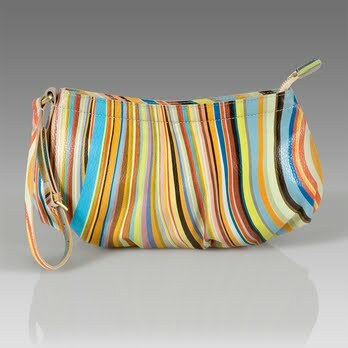 The bag is styled with an adjustable shoulder strap and has a zip opening. 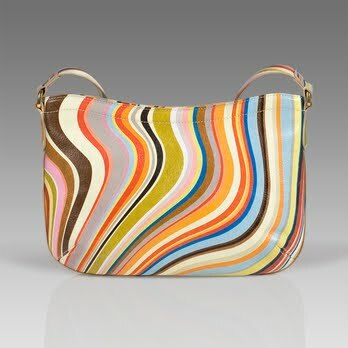 Paul by Paul Smith Lilah bag is made from swirl printed leather with adjustable shoulder strap. 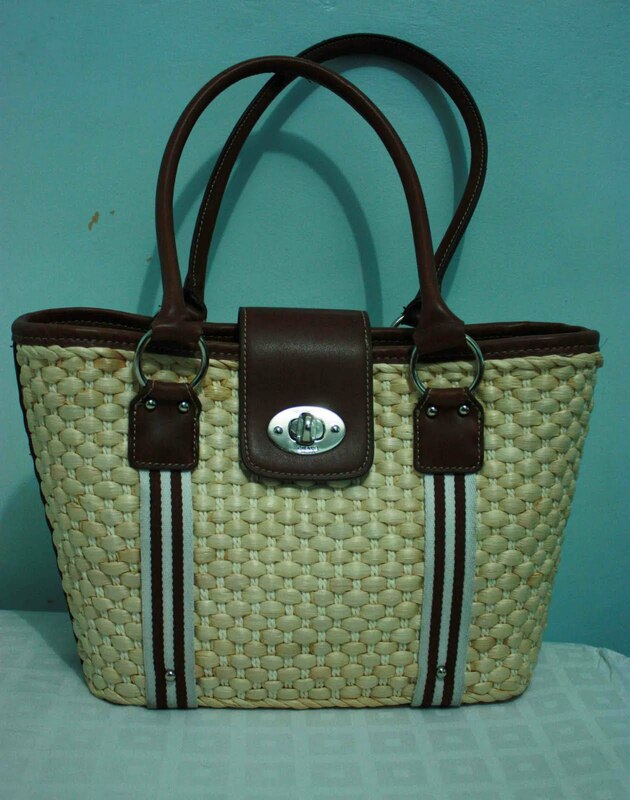 This bag is styled to be worn across the body; it has a zip front pocket with the main part of the bag also opened by a zip. Internally it is fully lined in cream swirl jacquard fabric with one pocket which is zip fastening with a vintage swirl leather trim. Paul X collection yellow label is appliqué internally. This bag is styled with rolled leather handles and decorative buckles which are fitted with magnetic poppers for ease when opening. It features golden metal hardware throughout. Other features include a studded protective base, internal cream ‘swirl jacquard’ woven fabric lining, internal mobile pocket and large side pocket with swirl printed leather trim. 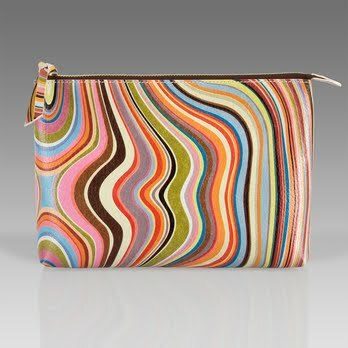 Paul Smith women’s swirl printed grained leather make up bag. 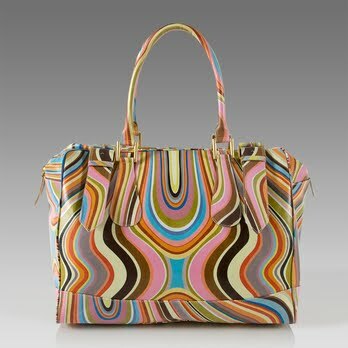 This bag is zip fastened and internally is lined in cream swirl jacquard fabric. Costs at 139 pounds roughly around Php 9,500. 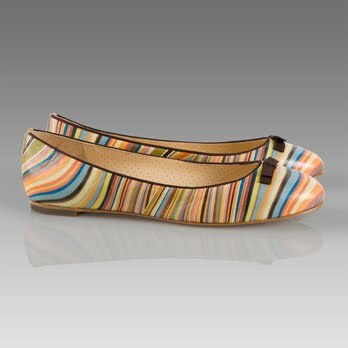 Jackie is a Paul by Paul Smith round toe, flat pump made with Paul Smith’s signature swirl leather material. They are embellished with a black fabric trim and bow and have beige leather perforated insoles and Paul X embossed soles. Stow bag included. Alvin: Parehas din yun! Ano ayaw mo?! Fleur: Hindi… joke lang.. Cracks nga eh! Lets go! One time naman, I was so sad about something. He was trying to comfort me..
Alvin: Wag ka na ma-sad babe.. Bibilhan na lang kita ng couch. Fleur: Eh meron na tayo eh..
Alvin: Ha? Hindi… Yung bag na gusto mo..
Fleur: Babe, COACH yun, hindi couch! Alvin: Siguro, etong si Mojo Jojo, primavera to. Fleur: Primavera? baka prima donna babe? Haha! Ginawang computer program ang dj! Kaloka! Alvin: Alam mo ba babe, nagalaga ako ng kalapati dati? Mga seven yun..
Me: Talaga? Ang dami naman!! Alvin: Konti nga lang yun eh. Yung kapitbahay namin mga 20 to 30 as in nagcuculture talaga sila. Me: Baka nagbebreed ng kalapati babe..
Ginawang bacteria ng asawa ko ang kalapati haha! Funny noh? We are like that everyday, masisiraan ka talaga ng bait! Have a nice week everyone! Love! Love! Love! I have always been a fan of ABS-CBN program SNN’s celebrity bag raid. Im so curious of what these celebrities carry in their bags. Sometimes I make gaya what they use and find them naman na recommendable talaga. So for The Family Girl Blog, I will be starting a series of Bag Raids. Siyempre to start, let’s raid my bag muna! LET’S GOW! 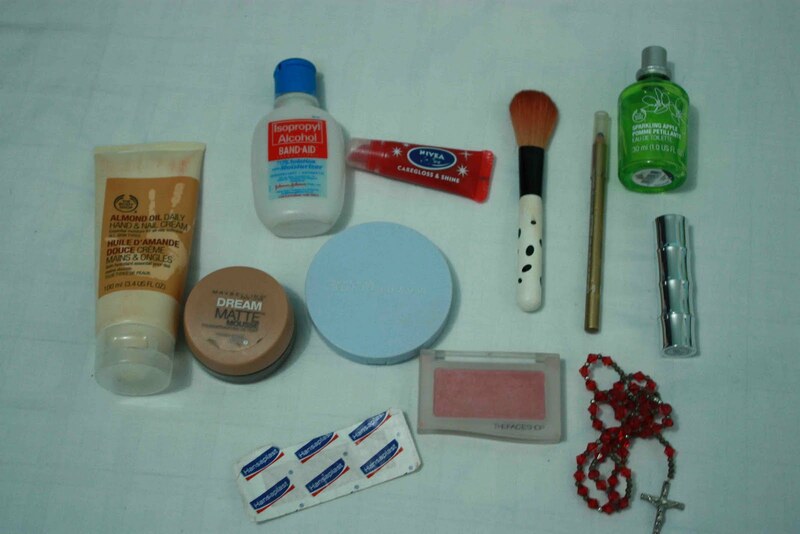 Here are all the contents of my bag which I bring with me everyday. -My kikay kit which I will show you in detail later. I just woke up one day and thought that I needed something to carry my make up para hindi siya sabog sa bag ko, and I borrowed the clear plastic that’s free with the Baby Couture Diaper bag. 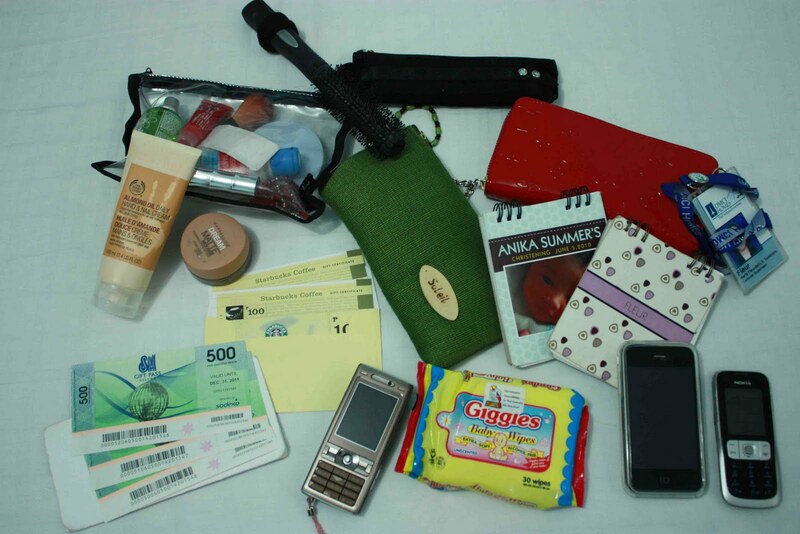 –Green Soleil pouch which carries my toothbrush and toothpaste. -My hairbrush with an emergency ponytail. -My black pencil case, a gift from my mother in law from Japan. -A red “LV” wallet given to me by my mother in law again which is so lucky that I never dare to use another wallet. Do you know na it’s luckier if you use a wallet that was given to you rather than the one you bought for yourself?! Old wives tale =) pero so far true for me! –Gift certificates from Starbucks (a prize from my friend Tiff’s wedding) and SM gift certificates given by my mother in law for Anika. I bring these everyday because you’ll never know when it will be of use eh. This is what’s inside my kikay kit. –Maybelline Clear Smooth Powder Foundation which is so gentle on skin and it only costs Php 200 only! I use this for retouching. –Nivea lip gloss. It acts as a lipstick and a lipgloss in one. It taste delicious too! Im a ballpen addict. Konti pa lang to compared to what I originally want to bring everyday. Mabigat na bag ko eh. 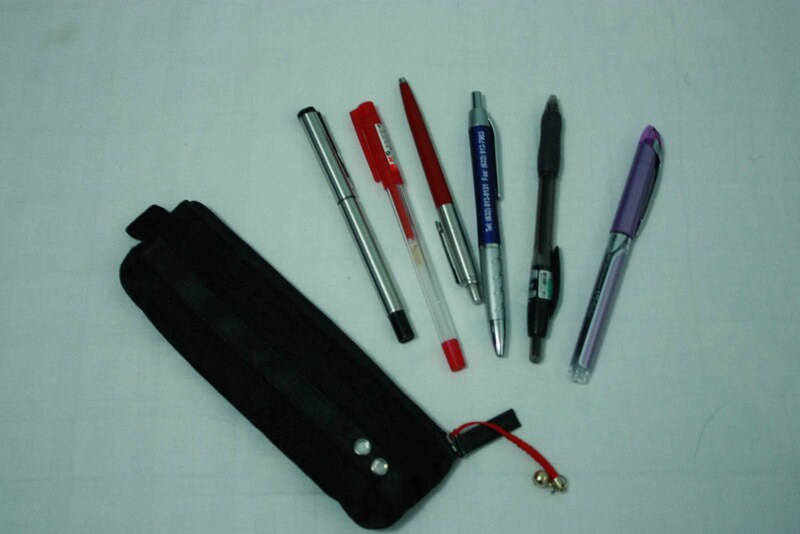 Here I have a Parker Signpen, Red ballpoint but signpen ang effect, a Parker ballpoint pen with my name on it, a ballpen Wilbert (my officemate) gave me, a super nice ballpen (super dark black ink) and my trademark violet pen which i use in signing forms and letters at work. There! We had na our first ever Bag Raid. Hopefully, you got tips and useful information from my bag’s content. I also want to let everyone know that I am super interested in what’s in your bags (and for sure, all blog readers out there too)!! If you girls (and boys) have time, I would love to receive pictures and descriptions of what’s inside your bag so that we can feature it here too! Please email them to me at fleurrubio@yahoo.com. Super looking forward in receiving those pictures from you guys! I have known Sher since 1997. Her parents and my dad are friends there in Amsterdam. But we didn’t become close until my last visit to Holland in 2004. Kasi everytime we go to Holland and we visit them in their house, Sher doesn’t really talk much. Later, I discovered, super mahiyain pala and she didn’t talk Filipino that well that time. Eh nabarkada sa mga Pinoy friends niya dun, so when I went back in 2004, chikahan galore na! I went to Amsterdam in 2004 as per advice of my doctor because I needed a change of environment daw. So i stayed there for 5 months. The first month was soo boring that I really wanted to go home na. But after a month, Sher invited me to go out with her and her friends and after that, ayoko na talaga umuwi! haha! I missed this girl so much grabe! She was the one i had my Paris adventure with. We went around Paris in two days! Super adventure kasi we were just commuting, shopping and muntikan pa kami ma-Chinese Mafia sa Louis Vitton store there! (Remember that mare?!) Kaloka talaga! 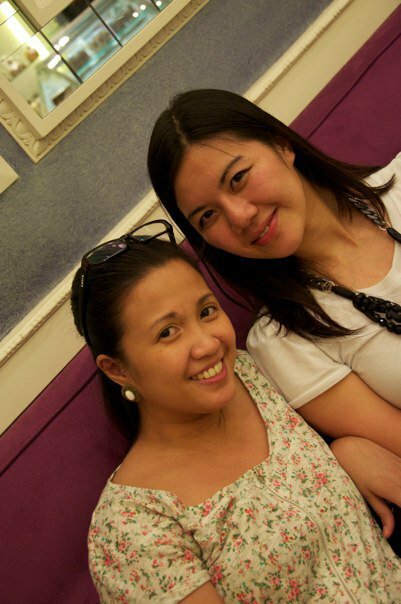 I had so much fun with her and after that, we became close friends na. Im really happy because Sher lets me know when she’s here in Manila and we make sure that we meet up. I was so excited when I received a text that she, Jeff (her hubby) and Jhadie (their super adorable baby girl) were already here in Manila! Sher, Jeff, Jhadie and I met up in Greenbelt 5. It was 3pm na already and they haven’t had lunch yet because they came all the way from Gapan (uwian yan ha!). Actually nagbabalik balikan sila ng Gapan-Manila-Batangas. Hehehe. 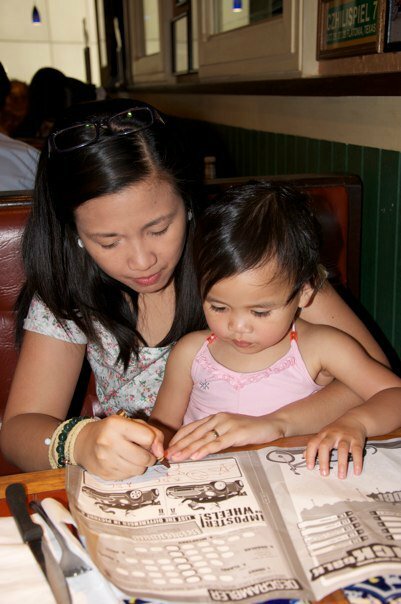 Sher told me bahala na daw ako where so I took them to Chili’s Restaurant and natuwa naman sila. They ordered steak and patat (french fries). Sher & I love patat!! Here I am with Jhadie. Sher’s baby girl’s so adorable and sweet! Manang mana sa mommy! Jhadie, Sher and I at Chili’s. 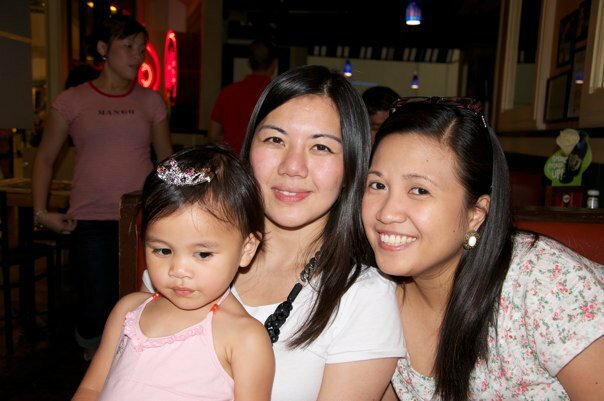 The tiara on Jhadie’s head is given to her by my highschool friend, Tin Mesina, who’s the manager of Chili’s in Greenbelt. Super thanks Tin! 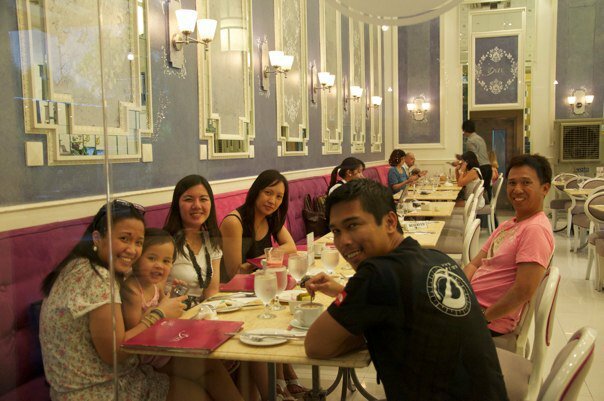 After our lunch, we had dessert at Bizu’s in Greenbelt 2. Here we are with Jhadie, Sher, Jeff’s sister and her japanese husband. I ordered 3 kinds of macaroons and Jhadie loved them so I let her eat all of them hehe. 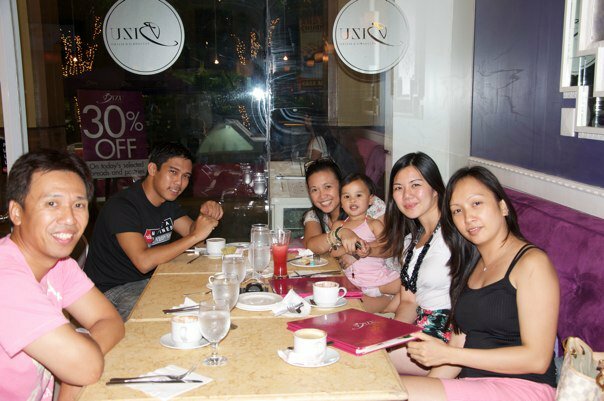 They ordered coffee and drinks na lang because full pa sila from our lunch. Jhadie’s dad Jeff took this picture. 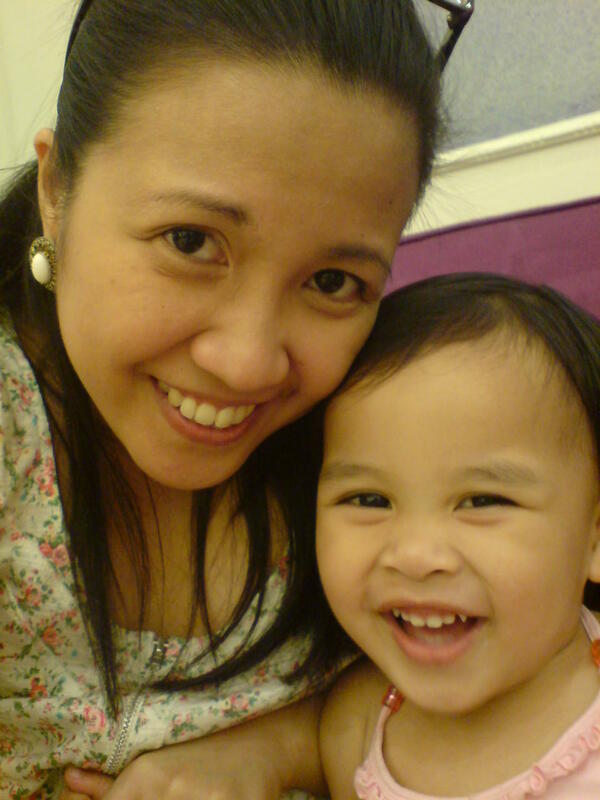 Natuwa si Jhadie sa camera phone ko so she kept on asking to have our pictures taken. Wait, I don’t have picture here of Jeff! He was the one who kept on taking the pictures eh. It’s okay. Take my word for it na gwapo siya. 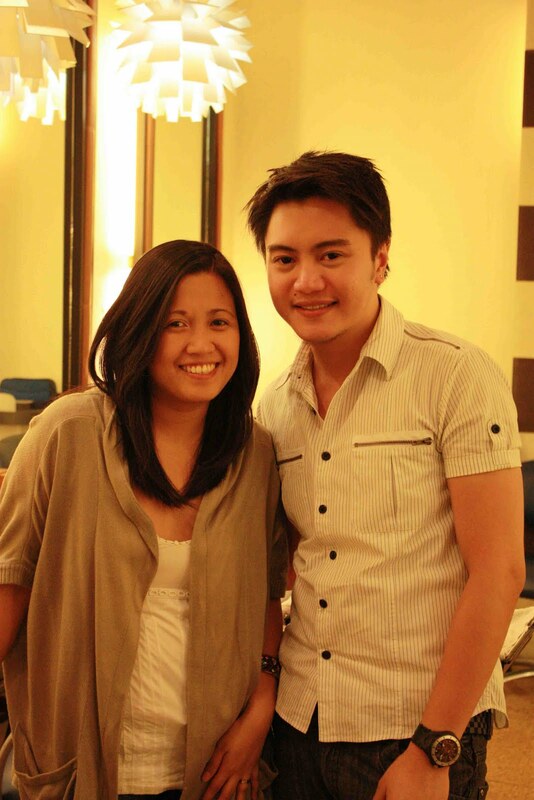 Sher and I belong to the lucky girls who are married to super gwapo guys. Uy, magsmile yan si Jeff! haha! Here we are, mga mommies na pero pretty pa din. My goal is to be as thin as Sher by the time Anika reaches the age of Jhadie. 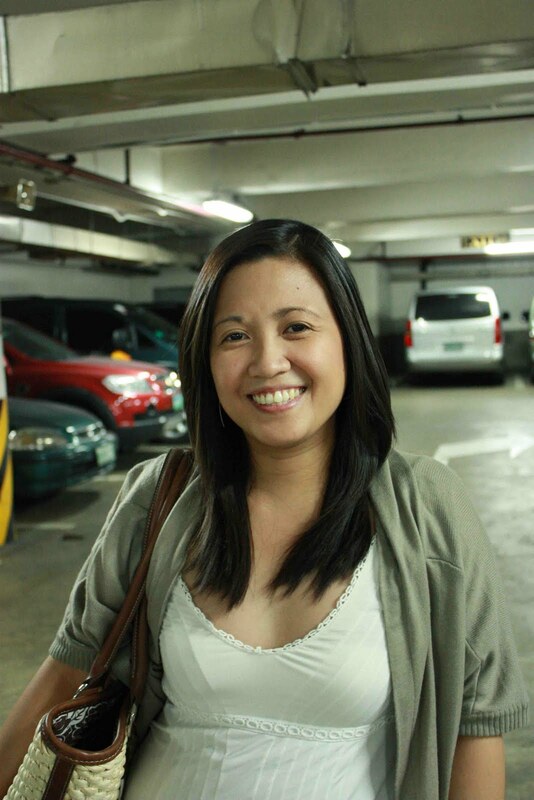 Fabulous looking ang Mommy Sher, parang dalaga pa din! Hopefully when Anika’s bigger na, we have the means to go back and forth to Amsterdam like what I did back then. Para close din sila ni Jhadie. For the meantime, sina Sher na lang ang magback and forth! haha! Hay naku mare, I can’t wait for our “cheap but fabulous” vacation next year!! Oh, I have to start planning that na pala!! Im so excited!! I’ve always been “maselan” (sensitive) about where to have my haircut. I do not just trust anyone. 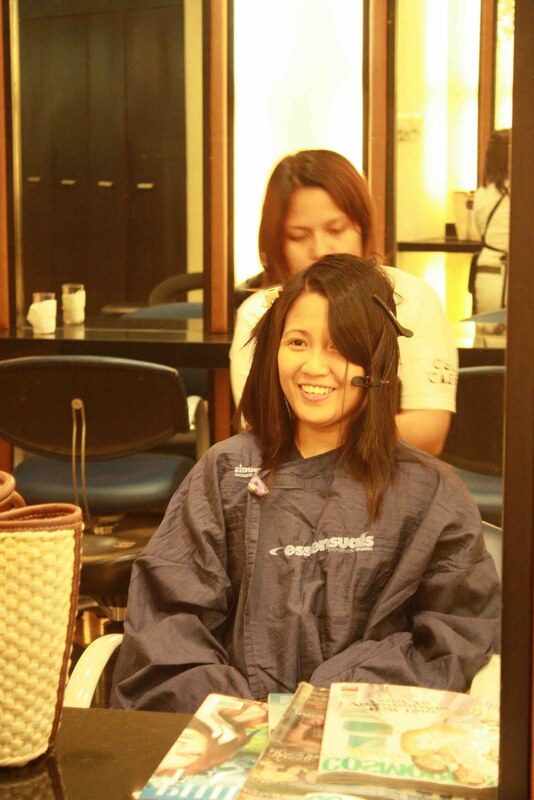 So since highschool, I have been going to Tata, my hairdresser, at Regine’s Salon in Makati. 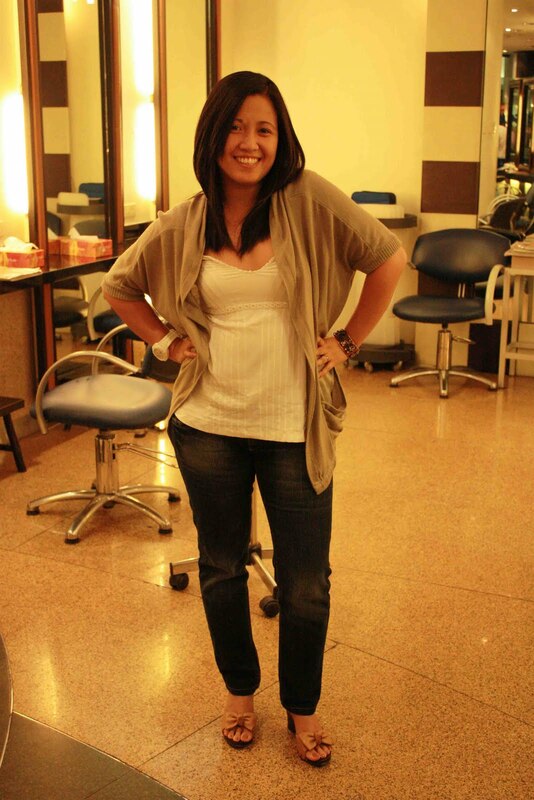 When Tata resigned, I had no choice to go to Rexy (Peachy’s hairdresser) also in Regine’s. However, I keep hearing nice things about Garod Ramelb (a hairstylist at Toni&Guy) from Li-anne Dacanay (and soon to be Matias), Alvin’s cousin-in-law. Li-anne’s hair looks amazing all the time so I decided to try it out. When I arrived, I was assigned to a spot then Garod approached me to ask what I’d want him to do to my hair. I told him I just wanted it to have some layers so it would have style. At the back, if it’s okay na naka-V siya. Kaso, Garod said that he doesnt advice the V thing sa back because it was so promdi. He said it naman in a nice way kaya medyo nahiya ako! Ang promdi na ng hair ideas ko!! Kaloka! After washing my hair, Garod began to cut it. He was so precise. Parang ini-isa isa ang strands ng hair ko. And he’s so friendly and professional. They offered something to drink but I declined kasi I was quite full pa that time. 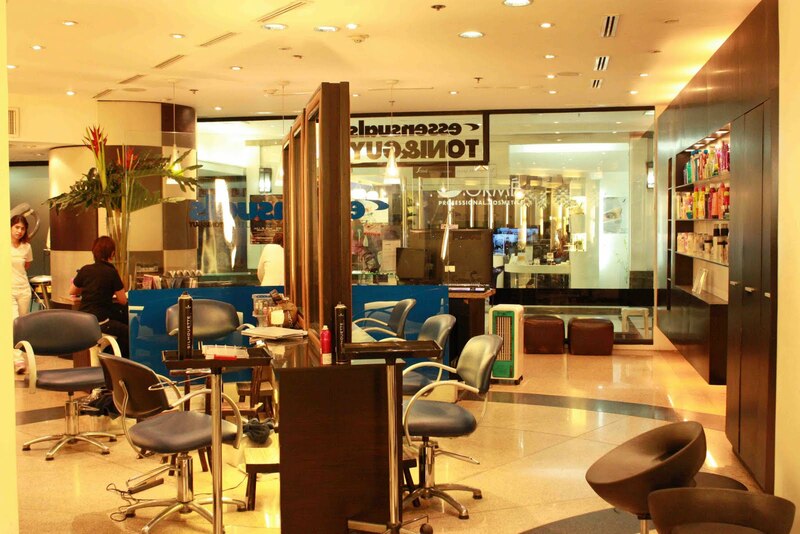 Here’s the inside of the salon. It’s clean and stylish looking. The products displayed at the right shelves are Bed Head products. Yun ang products daw nila. Here I was after Garod cut my hair. The kind lady (which I unintentionally forgot to give tip to, Im so sorry!!) was blowdrying my hair. Garod said he’d check it after it has been blowdried. Happy me! I was so excited to see the results! After consultation with Garod and before washing my hair, they made me wear this thing so that hair would not fall to my clothes. It’s similar to what the other salons are using but this one has long sleeves. I like it because sa iba, you’re body nga is protected pero when you use your hands na, hair goes to your arms which kinda irritates me. So I love this! I was texting with my friend Vivian because she and her hubby Omar was waiting for us at Cable Car. Here’s Garod retouching my hair. It was nice because particular talaga siya sa haircut. He was snipping here and there to make the haircut really perfect. Don’t you just hate other haircutters na parang nagmamadali? Here hindi. 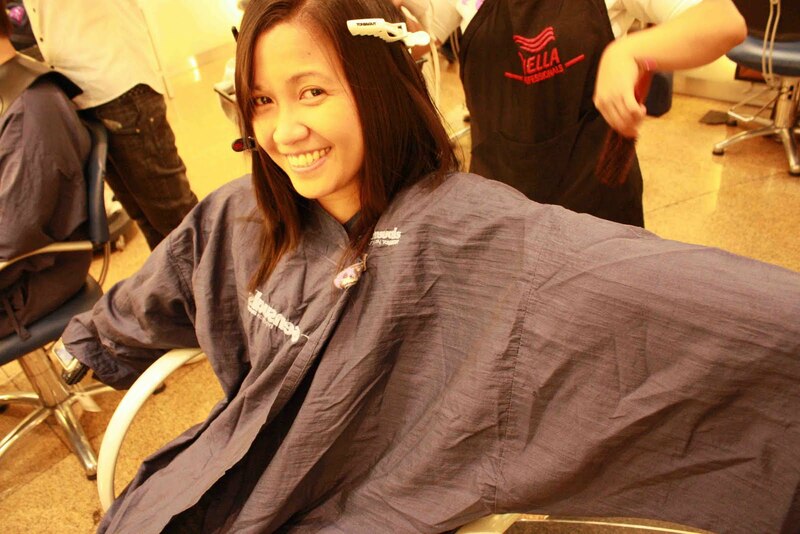 They will take time talaga to measure, re-assess then cut your hair. I felt really satisfied on how they gave attention sa hair ko. 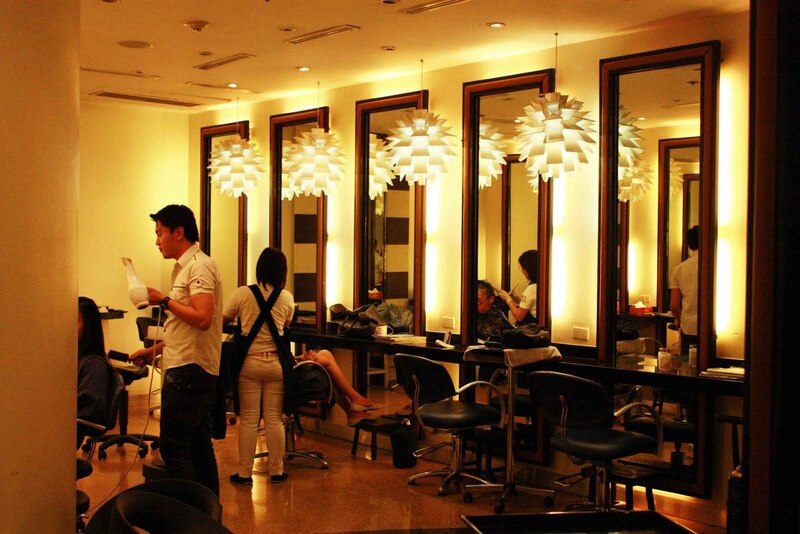 Here’s what the inner room of the salon looks like. It has a warm atmosphere and I love the hanging lighting fixtures! So stylish!! My hubby got bored hehe! Toni&Guy people are so nice that they offered drinks also to Alvin who was just making tambay beside me. Sosyal! Haha! This is me just before Garod finished the haircut. Garod said that after I take a bath the next day, it would not look that way because my hair underwent a relax treatment. He taught me how to dry my hair sa fan in the mornings and told me to buy hair rollers for the side lang so that when I remove it, it will look that way. 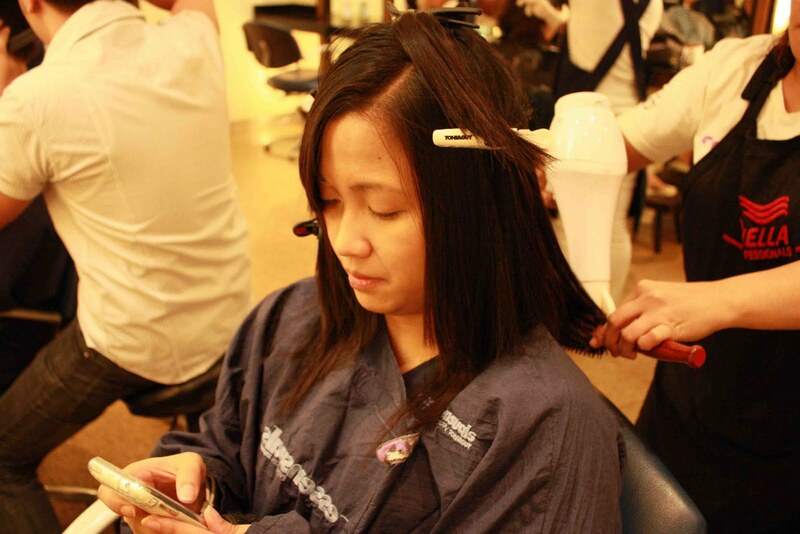 I can blowdry it but not all the time kasi sayang naman the relax. Here’s me with Garod. Ateh, ang pogi no? hehe! I super love my hair! Garod and the staff were so nice and accomodating. 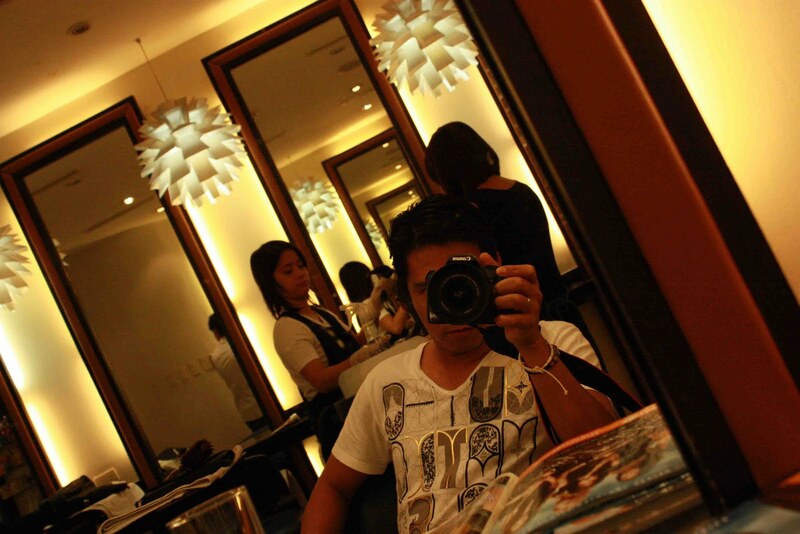 The haircut here costs Php 650 which was more that I usually pay for my haircut but it was totally worth it! REMINDER: Garod’s day off is Tuesday so if you’d like him to cut your hair, don’t go there on Tuesdays! My outfit for that day: Jag pants (my fat pants which i bought because none of my jeans fits me now), Mango white sleeveless top, the cover up that Faye bought me in thailand and Janilyn wooden wedges. Wacky pictures at the parking lot. The finished product. I so love my hair now! It has style na and movement. My expectations for my hair was met and my expectations for the salon was exceeded. I super highly recommend Garon of Toni&Guy! It’s a Saturday afternoon and Im so sleepy because Anika made me puyat last night. Well, I don’t blame her. I asked Girlie to sleep in her own bedroom last night so that Anika and I could have quality time together. 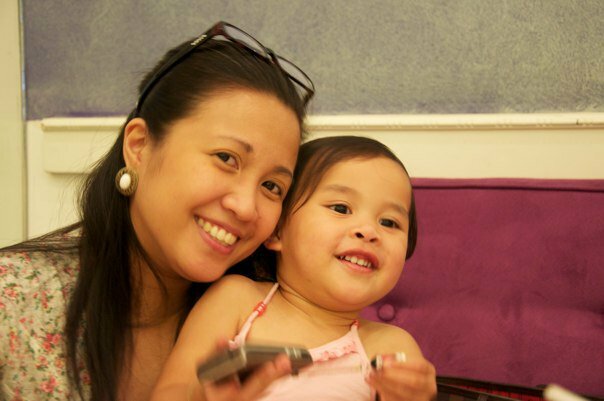 However, she went to sleep na at 9am so I took that opportunity to upload photos from last week in my facebook account. 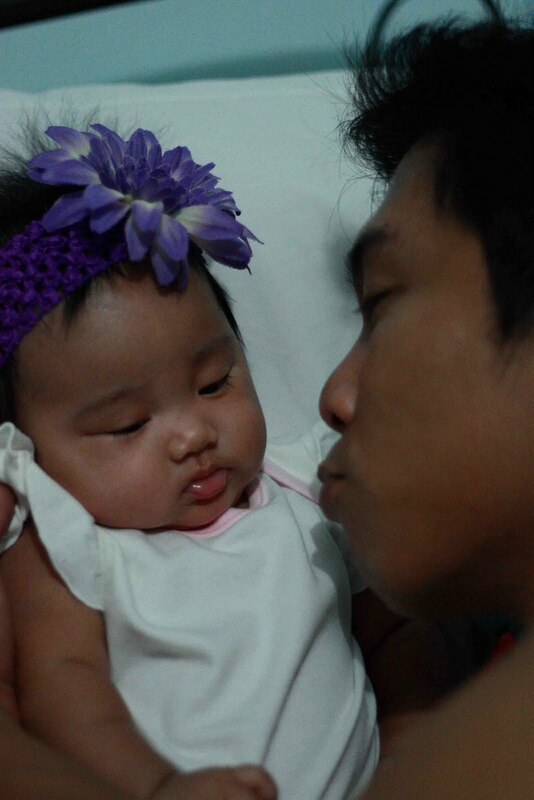 Then when I was about to retire to sleep na at 1am, she woke up naman and fidgeted (read: slept for 30 minutes then stay awake for another 30 minutes). So now Im soo puyat! 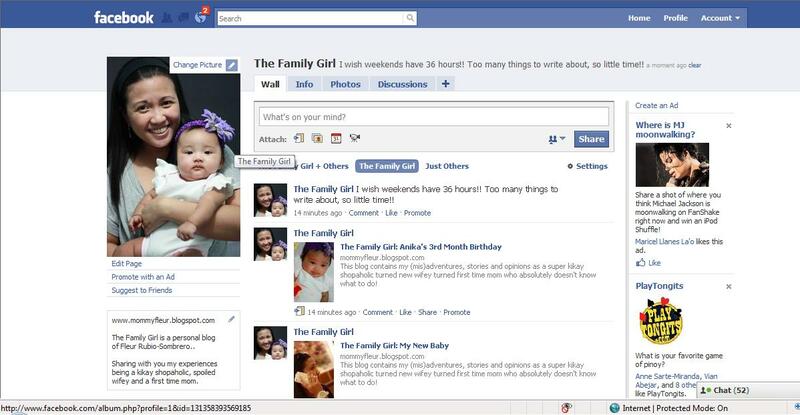 I created a page for The Family Girl blog in Facebook!!! I can’t nap because Im so busy letting others know about it! hehehe! 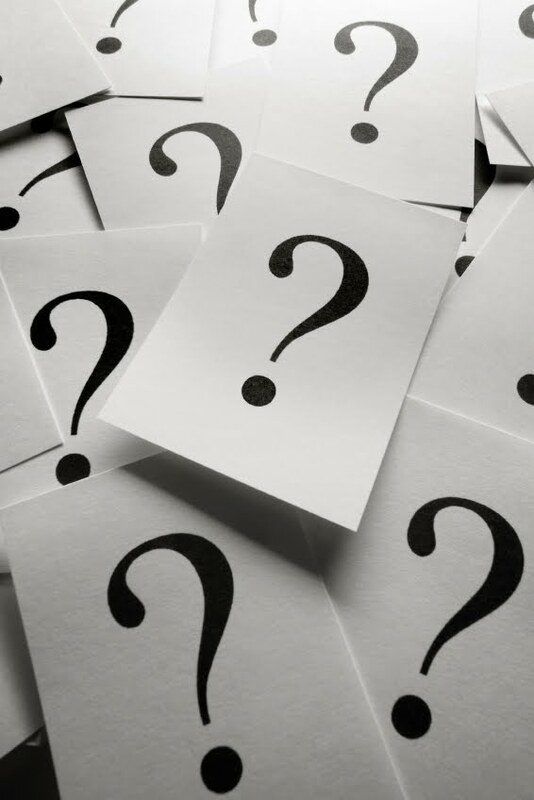 So friends, family, relatives, acquaintances and soon to be friends… Please do make me happy by visiting my page and clicking the like button HERE. My husband particularly told me not to blog about his poopoo problems and I know he will kill me for this pero I need help. Alvin needs to eat a lot of fiber. As in mega lots! Kelangan hindi siya mahirapan magpoopoo..
Ang alam ko lang source of fiber is oatmeal. So I bought a lot. Di daw niya type yung lasa, so I bought Nesvita chocolate flavored drink. Kaso baka mauta na naman siya. I need suggestions what to feed him for breakfast. I also bought vegetables. I dunno if they are a good source of fiber but I know veggies are healthy so I bought sitaw, eggplant, sayote, ampalaya and kangkong. Last night, inadobo namin yung kangkong. Today aadobohin namin yung sitaw and eggplant. Im not sure kung pwede i-adobo yung sayote..
Pano ba? Wag naman laging adobo. What dishes are good for the tummy para okay ang bowel movement? I have a new baby and I didn’t have to go into 36 hours of labor to have it!! Lol! I still love my original baby girl the most though, iba pa rin talaga pag pinaghirapan haha! I have been a globe subscriber for 10 years now, postpaid. 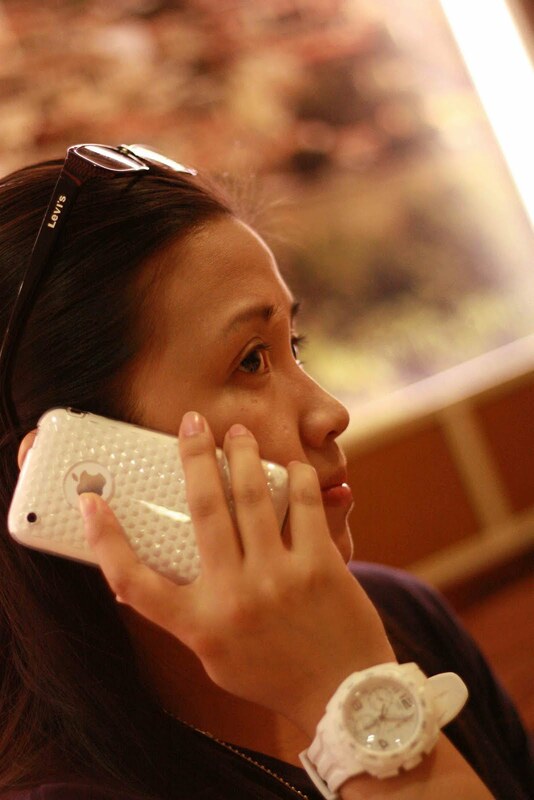 For that, Globe telecoms gave me a reward for my loyalty– for a fee! Pakker! Kamote talaga ang Globe I swear! 10 years tapos may fee pa din?! Anyways, I was having my Globe line cut already but they called and persuaded me to renew my 2 year contract with them. They’d give me daw an Iphone with a cashout for only Php 24,000. 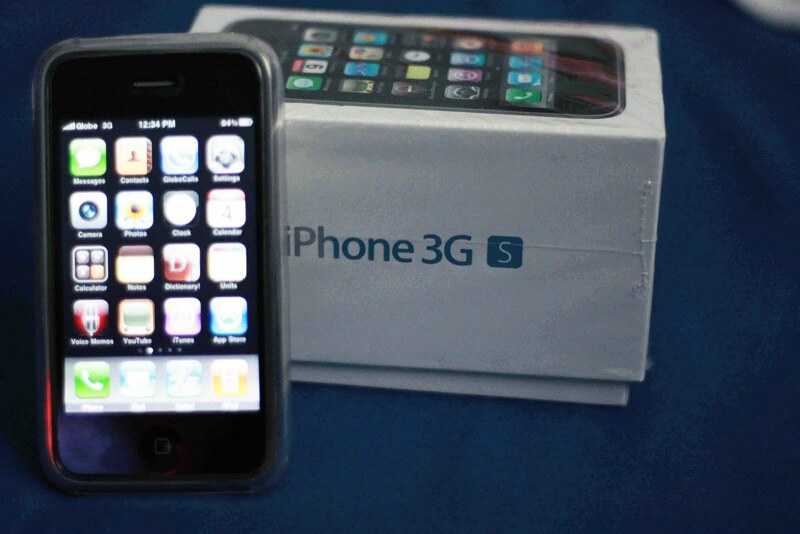 I canvassed around and found out, they were selling Iphones for Php 39,000! Pwede na kaso Im not a fan of Iphones. I think Im the only person in the kikay world who doesn’t even have an Ipod. Seriously. With the phone, I feel kasi touch screen mobile phones are complicated so I stuck with my Doopod and Sony Ericsson phones for the longest time. Hindi daw pwede. They need to “jailbreak” my phone, for Php 1,300, so that they can install various applications. The catch is, the phone warranty will be void. AMP! Ano ba yan!!! We didn’t want to so we just went home. I was beginning to make sisi why I bought the Iphone na in the first place. Note: Abie sells Iphone and Ipads too! So let me know if you guys want to inquire so that I could ask her ayt? When my phone came back from Abie, I felt that it’s the rockstar among all the Iphones out there!!! I have GPRS that uses the something else so it doesn’t get charged to my cellphone bill. I have funny and entertaining games, bible, rosary, dictionary, unit converter, facebook, y!messenger, google, about cities in the Philippines (about,where to stay, go and eat in every province), translator, first aid, POKER, BLACKJACK, mtvs and lots and lots of songs!!! I love it!!!! Here naman are my various phones who I have spent numerous happy and sad times with. 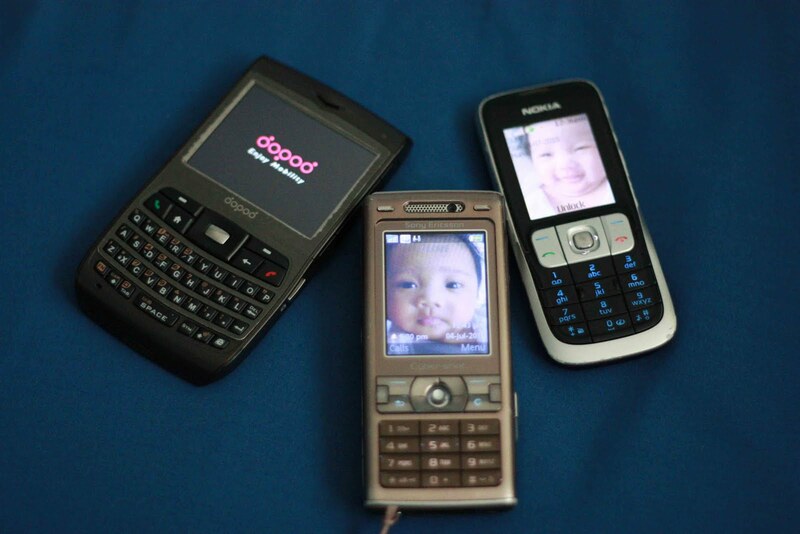 From left: my Doopod (which is Im told faced out na daw), my Sony Ericsson Cyber Shot Phone and my Nokia phone which I use for Sun mobile. Madami na kaming pinagdaanan mg mga phones na ito. Kaya eventhough I can sell them, I wont. Im so sentimental that I cannot bear to part with them. Now I see what the commotion was all about sa Iphone. I’m 3 years too late pero better late than nevah! Dont you think?! Now Im an Iphone fan na! *wink! Yesterday was Anika’s third month birthday. Time flies noh? Parang kelan lang she looks so tiny and fragile pero now, she weighs na 5.9 kilos! She’s so fat that she looks like a baby buddha na =) She’s drinking kasi Nutrilin Vitamins plus Vitamin C. So I guess effective ang vitamins niya..
Anyways, from work, we dropped by Red Ribbon (as usual) to buy her cake. I was supposed to buy na lang a ube half roll cake para tipid but Alvin didn’t want to. Wag daw tipirin ang anak niya. Osha, ibawas ang difference sa allowance niya next week har har!! Sorry for being so kuripot but I’m trying to budget around what he and I are earning per month (minus his manager’s commission which will go to our savings). What is in our bank now will stay there and hopefully be forgotten para may sure na savings. I like this picture of me and Anika but I don’t think we look like each other here, noh? Check out my hair! Nice, straight and long.. 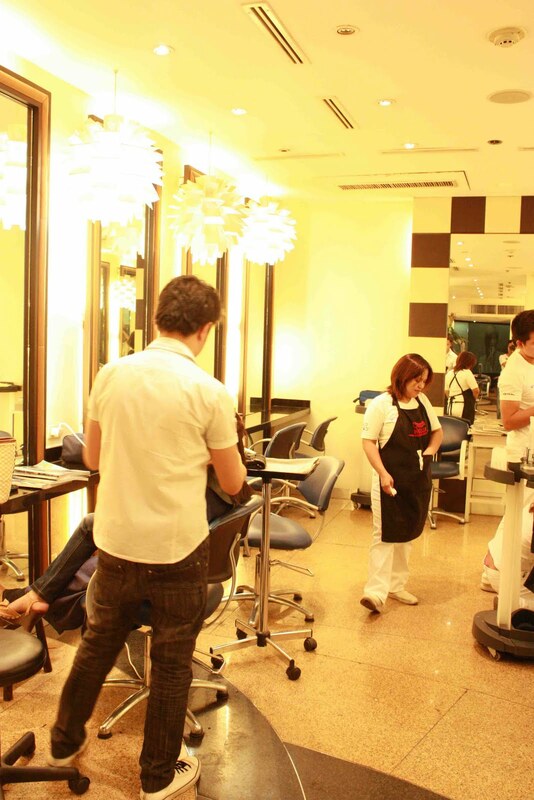 I had it relaxed at Fix Salon in Glorietta 4. Php 1,800 only. 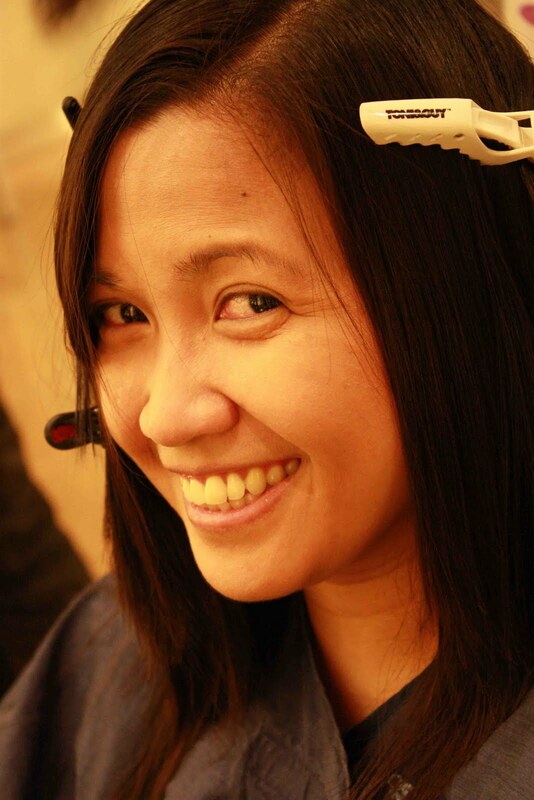 I was happy with how they relaxed my hair March last year because tumagal talaga so I came back for another round. 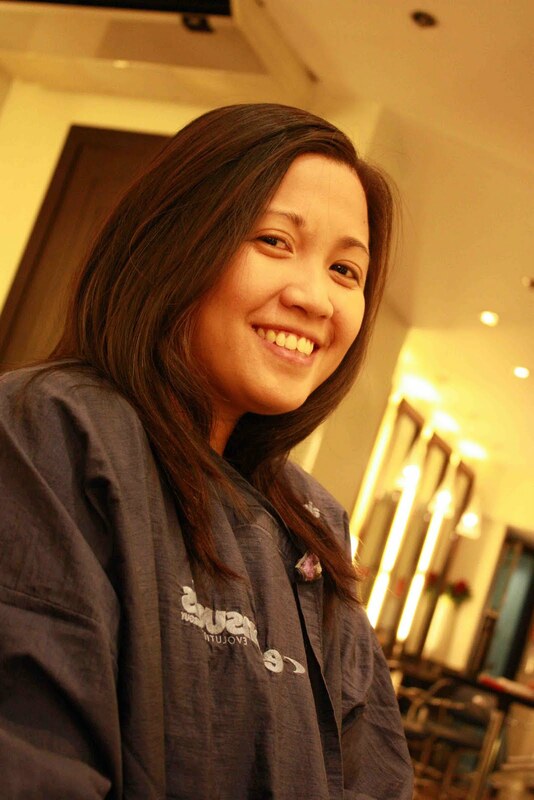 Yeah, I was supposed to have my hair digi-permed pero they said nakakataba daw ng fez kaya relax na lang. Masyado na ako mataba. Wag na natin dagdagan ang fatness look ko right? Lol! The Birthday Girl! 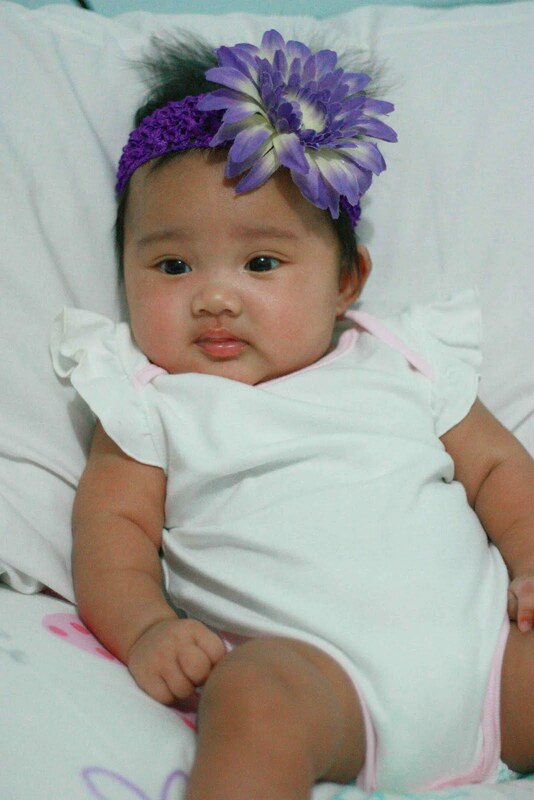 Anika’s wearing a ruffled sleeves onesie that Ninang Faye gave her. Her purple headband is from Sassy Hairsies which I found in the internet. They have lots of designs where you can choose from for you and your baby girl. The owner was so sweet that when my orders arrived, it came with her Christening gift for Anika. A white hairpiece which she wore during that time. You can order these hairbands here. Anika with her birthday cake (Chocolate Mousse from Red Ribbon Bakery) and party guests. Mukhang di siya masyado happy sa mga party guests niya no? Hehe. To her left is Moo-nique which I bought from Chicco for Php 899. It’s a learning stuff toy (a montessori learning toy according to Ninang Fay) which I found so cool. Babies can learn how to button, velcro, zipper, snap and tie. Cool diba? To her right is Mr. Ellie the Alien. 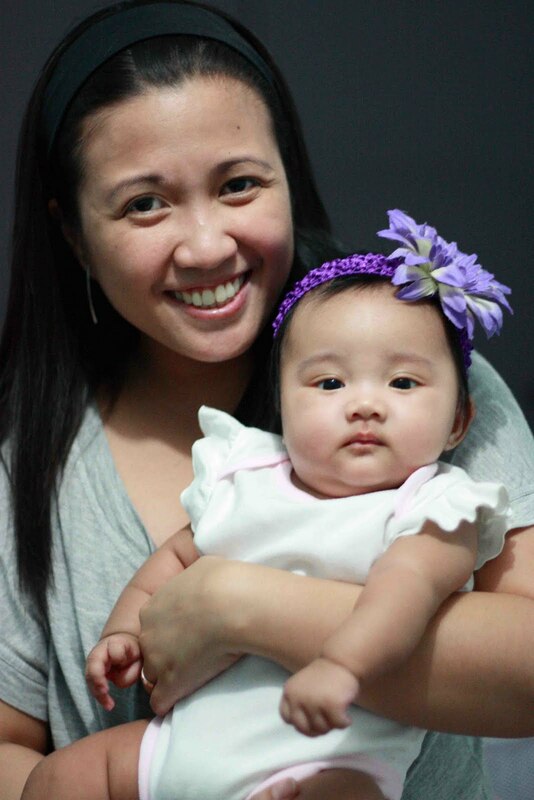 It’s a christening gift from Dra Capeding, her pediatrician. Bongga ang pedia ni Anika, di na nagpapabayad, nagreregalo pa!! Hay! We love her so much! Hehe! Anika enjoys Mr. Ellie so much because his face lightens up and there’s music coming out of him if you press his stomach. The music settings can be changed from playtime to sleeping time. 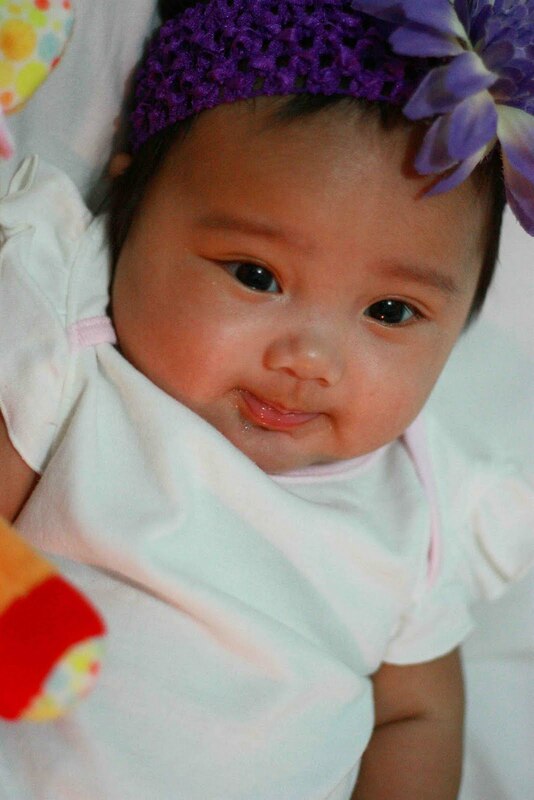 The kyoot baby girl. Sometimes I stare at her and wonder what I did to make God so happy that He gave me such a wonderful gift. Here with Alvin. Anika’s becoming a real Tatay’s Girl talaga. Now pa lang kitang kita na. She’s so arte whenever Alvin’s around, I swear! She looks at him while tilting her head then she’ll smile. Todo pa-cute! And siyempre, her Tatay is so putty in her hands. She’ll cry, without tear ha arte lang talaga, so that Alvin will do his funny dance then she’ll laugh so hard. When Alvin stops, she’ll “cry” na naman. Hay, nauuto ang Tatay! I changed my blog’s layout and then my visitor counter disappeared!! I had to re-install it and so now my blog’s visitor counter went back to zero!!! I wanna cry!!! Last time I checked, this blog had more than 1,000 hits already!!! 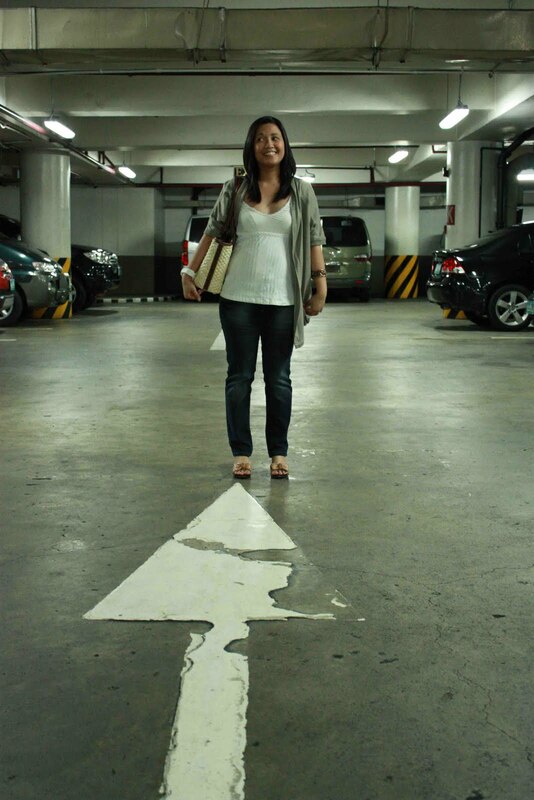 Anyways, whatever.. Ano pa magagawa ko di ba?! Hmp!